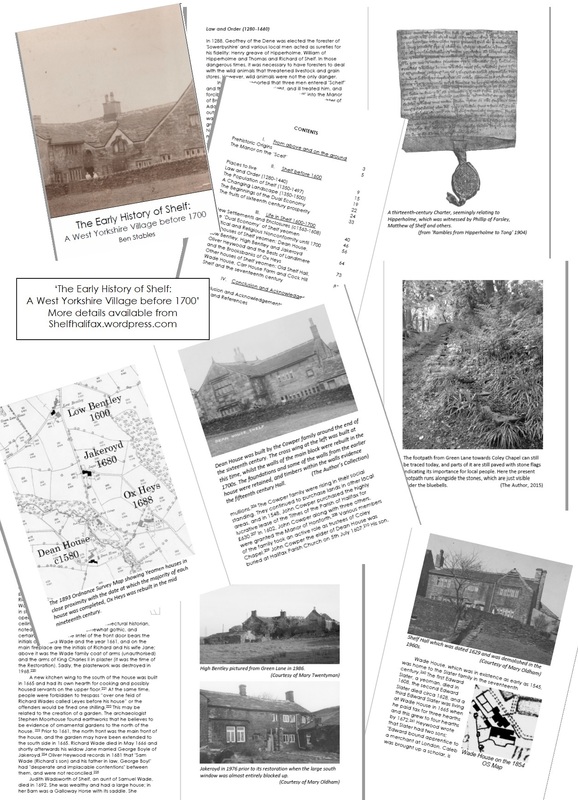 ‘The Early History of Shelf: A West Yorkshire Village before 1700’ published by the author, Ben Stables. Price £5 per copy. Never before seen research to explain the development of Shelf until 1700. In its early history Shelf developed from a moorland and forest into a landscape full of activity: the roads and farms we know today were laid out and the place names we use today began to be used. Meticulous research brings alive forgotten stories of ordinary and not so ordinary Shelf residents. Find out about William, the 14th century “Clerk of Shelf”, the 16th century windmill, William Cowper who lost his families estate and was starving as a prisoner at York in the 1630s, a nasty dispute over a pew at Coley Church in 1685, and much more.